Spin This: "Dreams," "Stand By Me," "You've Lost That Lovin' Feelin'"
Bouncy sunshine sound prevalent on most of the tracks; arrangements surprisingly entertaining. The lively band and production levels are also top-notch. If you thought for one second that disco band KC & the Sunshine Band was done with show biz, think again. 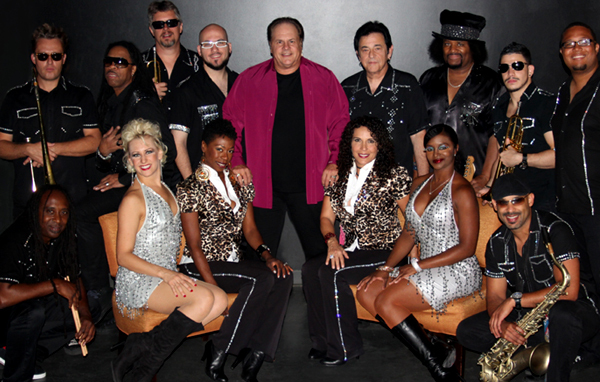 Harry Wayne “KC” Casey, the frontman for the hit-making Sunshine Band, has never hung up his boogie shoes, especially since the “Shake Your Booty” pop-disco-funk band celebrated its fortieth anniversary in 2014. And up to that point, they’ve been faithfully touring the globe playing to large arenas and festival crowds. Recording music, on the other hand, has slowed down to a crawl: Their last album was actually 1993’s Oh Yeah! That was until Casey uncorked new music in 2013 with “I Can’t Get You Out of My Head,” the band’s first big push in to EDM territory. From that announcement came the idea of new music and a few blurbs about a set of new albums, even newer material. 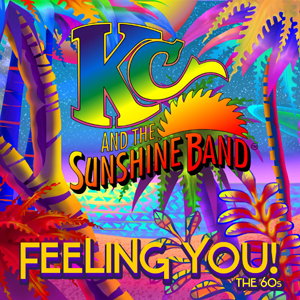 Feeling You: The 60s, a lengthy seventeen-track nostalgic collection encompassing sunny covers from 1960s and some early ’70s favorites, is the first to come from the group. Although the market is ripe with thousands of cover albums, and this isn’t exactly the first thing one would expect from a group used to pumping out original material, this disc is a pleasant surprise to the ear. Firstly the choice of songs are a mix bag of favorites and subtle gems deserving of a little extra exposure. When Casey and his competent list of co-arrangers (Harry Cadenhead, Stephen Lashley, David Simmons, Jeffery Reeves and original member Fermin Goytisolo) drop their clever arrangements to the mix, low expectations are dashed completely. Secondly the band sounds superiorly inspired. When they kick out their funky cover of the Allman Brothers’ 1969 “Dreams,” it completely overshadows convention. It’s not as brash as “That’s the Way (I Like It),” but it’s just as riveting. That song — full of jam solos, funk-powered guitar plunks and Chicago-esque horn arrangements — is just one of the prominent highlights on the disc. That same kind of energy can be heard on the swinging uptempo take of Ben E. King’s “Stand By Me.” Although the chorus loops play a bit past its time expiration — stretching past five minutes, it clearly possesses the pop-funk that proved definitive in their early work. The Bacharach/David standard “Always Something There to Remind Me” proves to be a decent opener, while “You’ve Lost That Lovin’ Feelin'” comes with a bubbly calypso vibe that matches the Righteous Brothers original. The paradise gleams of “Both Sides Now” completely overshadows Joni Mitchell’s 1969 version, turning the folk tune into a Beach Boys heavensent. It’s no secret that Motown had a major influence on KC & the Sunshine Band; you can hear that inspiration on some of their earlier tracks . You’ll find a barrage of Motown covers tucked inside Feeling You! The 60’s. Some are actually quite memorable. The cover of Edwin Starr’s “Oh How Happy” carefully merges the sweet Miami sound with that of Motown. “You Keep Me Hanging On,” co-produced by Eric Lue Young and Anton Boyarkin, is turned into a light synth pop showcase. Smokey Robinson’s “You’ve Really Got a Hold of Me” copies the original musical formula, satisfying Casey’s doowop cravings. Probably the most intriguing of the Motown covers is the ballad-type arrangement of H-D-H’s “I Hear a Symphony.” The tune is transformed into a soul ballad using big Patti LaBelle drama breaks. Even though Casey misses out on a golden opportunity to croon the song with the fiery gusto it so desires, the unexpected arrangement and the many others like it are what makes this album so appetizing. Let it be known that the disc bears a few challenges to make one’s face scowl with discomfort. The now-dated “Sweet Soul Music” should have been lyrically updated to include surviving soul legends. The gospel sounds heard on their cover of “Blowin’ in the Wind” doesn’t quite excite. The Auto-Tune makeover on Casey’s voice on “Dreams” also seemed a bit unnecessary. And there’s even the obvious quibbles facing Casey’s present-day vocal range, which seems a bit lower and even gravelish in spots. But that doesn’t stop him from having the time of his life. “I really went outside of the box vocally and creatively,” says Casey in a recent press release. “[This album] is autobiographical, showing how I feel about love, life and the world through the music of that era.” It’s obvious that these old school tunes were key inspirations on his own musical upbringing. As a homage to that important period while also acknowledging his own style, Casey and Company create a sweet blend of their own trademark sound with the sounds of jukebox lore. Most certainly the album would have been praised to higher acclaim had it been chopped down some. And maybe those leftover tunes would have been perfect for a 2.0 update. But Feeling You is still a delicate ride into nostalgia without actually feeling like a product lost in time. That’s because most of these covers come with the band’s all-original and all-unique Sunshine sound. That alone is worth the price of admission.